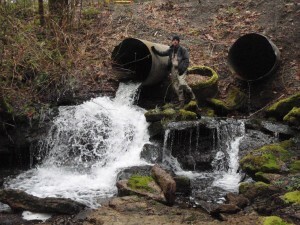 SPSSEG received funds from the Salmon Recovery Funding Board to replace a set of fish barrier culverts on Midway Creek, a tributary to Goldsborough Creek. The culverts, perched eight feet above the creek’s confluence, have blocked fish passage in Midway Creek for many decades. The project’s goal is to replace the perched culverts with a fish-friendly, box culvert that will open fish passage to an entire tributary system which will provide rearing and refuge habitat for Goldsborough Creek salmonid species.